Lighthouses are some of the most beloved symbols in America. Standing stoically, putting out light for the safety of boats and crew, lighthouses have been important since ancient times as a critical source of outdoor lighting. Brighter Homes Lighting Gallery serving Eugene and Salem specializes in outdoor lighting. We offer outdoor lighting for all of your important outdoor spaces, such as your patio, walkway, and entries. Below, we’ll take a brief look at this important outdoor lighting source, the history of lighthouses. Contact us today! When humans began to travel, light became paramount to see by at night — and often it was the lack of light that stopped humans’ progress while traveling. It was easy to post your horse, start a fire, and pitch a rudimentary tent; however, when you’re on a boat, the boat can be in constant motion. In the middle of a storm where you didn’t have a lot of control over your boat, light could make the difference between being shipwrecked or not. Signal fires were first used on the shore for guidance for boats. However, the quest to improve visibility for ships led to the lighthouse, an elevated outdoor lighting solution. Fundamentally, a lighthouse is a house with a light, specifically an entry lighting to guide boats to port and warn of impending rocks on the shoreline. One of the Seven Wonders of the Ancient World was a lighthouse — the Lighthouse of Alexandria in Egypt, which stood for over 1000 years until earthquakes and disuse took its toll. The need for outdoor lighting only grew as humans began transatlantic travel in earnest in the eighteenth century. Lighthouses began small, but advances in structural engineering and new and efficient outdoor lighting equipment allowed for the growth of lighthouses. As lighting technology grew, the amount of light a lighthouse produced allowed rocks and reefs to be visible to ships at sea. Boston saw the first lighthouse in 1716 and by 1820, America had over 250 major lighthouses operating. Many lighthouses are now superfluous since most boats and ships navigate by GPS exclusively. Smaller lighted buoys is often all that is needed for ships navigating at night. Outdoor lighting with the advance in powerful light sources such as LED (light-emitting diode) lighting has grown by leaps and bounds. These outdoor lighting sources allow us to make our homes in a welcoming beacon of light to visitors and us. Promoting safety and security, outdoor lighting, provided by such items as driveway lights, entry lights, garden lights, and accent lighting, is now a cherished part of your outdoor space in beautiful summer nights under the stars. 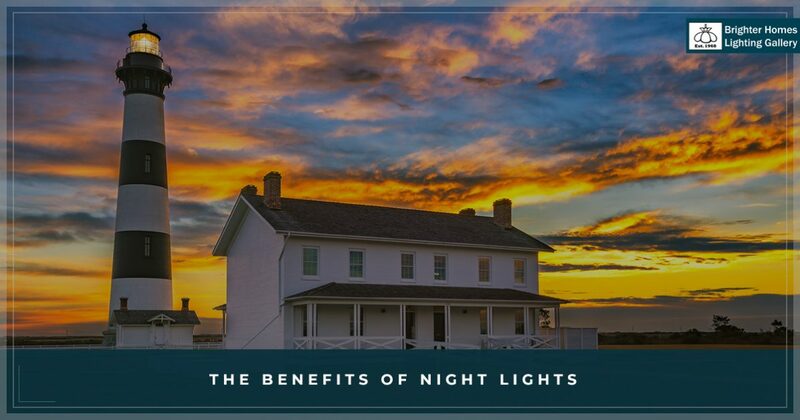 Brighter Homes Lighting Gallery offers outdoor lighting and modern lighting for homes similar to how lighthouses offer outdoor lighting for boats — to welcome you home, keep you safe, guide you in a storm, and provide comfort in the dark. Our lighting solutions are constantly being updated with timeless classics to the latest and greatest in lighting technology. Contact us today for all of your outdoor lighting needs!